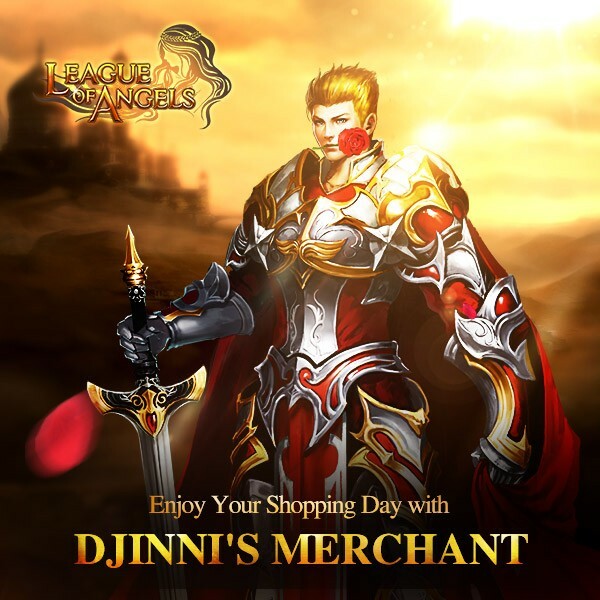 North America Forum»Forum ›League of Angels ›News and Announceme... › Shopping Day with Djinni's Merchant! Shopping Day with Djinni's Merchant! Description: Buy items with Darics from the Djinni\'s Merchants for a discounted price; they will be up to 90% off. - Daric can be obtained from Today\'s Gift, Total Recharge Reward, Gemology , All-Round Talent, Omnipotence and Fishing Soul, or exchanging Diamonds or Vouchers at a 1:1 rate. - Click the “Refresh” button for a chance to buy different discounted items. The commodities include Cerebus Shard, Azul Wolf Soul Shard, Iron Cockatrice Shard,Lover\'s Reunited Shard, Enchanted Ore, Blessed Stone, Soulstone, Seraph\'s Stone, Gem Enhancement Stone, Element Crystal, Aegis Shard, Refining Stone, Runestone,Lvl. 3 Cherubstone, Lvl. 3 Holy Crystal, Lvl. 4 Cherubstone, Lvl. 4 Holy Crystal, Lvl. 5 Superior Gem Chest, Lvl. 5 Common Gem Chest, Angel Tears, Gold, and many more. Description: Log in every day to win Darics! More exciting events are coming up through May 9 to May 11 (server time). Check them out in the in-game Hot Events menu now! Get that Azul wolf guys, now\'s yer chance, good luck. On a related topic, unlike the two above me (??? ), hello mr Wolf!! Why does it stop at S935? 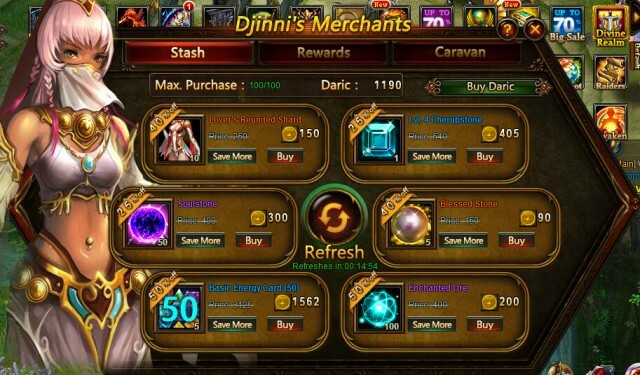 Djinni\'s Merchant has not appeared on Oceanic Servers, HKT!!! 2019-4-20 14:58 GMT+8 , Processed in 0.075060 second(s), 52 queries .